MPG (Multi-Purpose Green) bullets feature a highly frangible, powdered metal copper tin core inside a guilding metal jacket. Unlike frangible bullets lacking a protective jacket, MPG bullets remain intact under the rigors of handling, feeding, and firing. This eliminates the primary cause of jammed actions and plugged barrels often experienced when firing frangible ammunition. 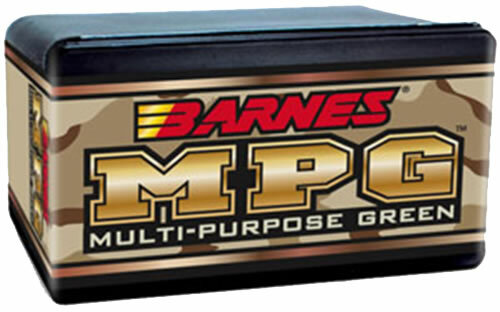 Barnes' Multi-Purpose Green bullets are exceptionally accurate. They are ideal for shooting steel targets, competition, plinking, varmint hunting, and home defense. Nice bullets - can't wait to go to the range..
Barnes MPG bullets looks great,.I'm loading them up for a friend, will follow up after a hunt.